Carnival of Thrills at Bet365 Bingo | WIN £100 Daily! Lord Bingo News Bingo Promotions Play Carnival of Thrills at Bet365 Bingo for Cash Prizes! Play Carnival of Thrills at Bet365 Bingo for Cash Prizes! 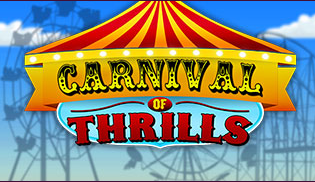 Carnival of Thrills is a new and exciting June promotion happening at Bet365 Bingo! You could win £100 in daily cash prizes and up to 1,000 Loyalty Points each week! All you have to do is play bingo to collect tickets to the daily and weekly carnival prize draws. Wager just £10 in bingo or £5 in the Catwalk, Kiss & Tell, Bargain Bingo, Mojo Lounge, or Super Star Bonanza to receive a ticket to the prize draws! The more you play the bigger your chances are at winning! Make sure to head to Bet365 Bingo and ‘Opt in’ to qualify to win. Carnival of Thrills runs June 1st-28th so make sure not to miss your chance at the £100 daily cash and weekly Loyalty point prizes!